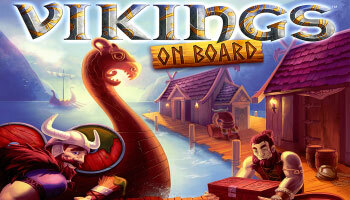 Vikings on Board is a worker placement strategy game. Your objective is to set sail successful with your Viking clan, while at the same time placing bets on which clan you think will control each ship as they set sail. You score points by controlling the best-supplied ships when they set sail and by placing bets on which clan will control a ship when a ship sets sail. The players have a set of workers and place them on the board to select different actions. The ships have different sections: front (bow), middle (body) end (stern). You can place supplies on the front and move to the other sections to get the majority control of the ship. A player can do different actions like: add supplies to a ship, rearrange ship pieces, place a bet on the ships, swap ships, jump any ship, incease the value of supplies in the market or set sail. The action you select one round will determine the turn order of the next round. Each player has six "body" pieces of the ships in the game, and these can have 2, 4 or 6 shields. When a ship sets sail, players will share its supplies in order of how many clan's shields they have on the body of the ship. The player with the most shields will claim a supply token from the bow and place it facedown on the scoring circle. These tokes score points at the end of the game depending on their value in the market. Then, the player with the 2nd most shields can claim a supply token, etc. When there is a tie, the order of the body pieces is important. The player with their shields closest to the front will then win. Betting goes like this: you place one of your tokens (numbered 1, 2, 3, and 4) on one of the four circles in front of each ship. When 7 ships have set sail, the game is over. The scores are calculated and the player with the most points won the game. The game is not based on luck but a very tactical game. 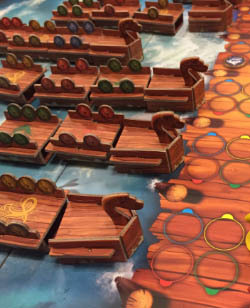 Vikings on Board can be played by 2 - 4 players older than 8. The game is best played by 3 or 4 players. Most games take between 30 and 60 minutes.